An ideal villa for large family or 2 groups as ground floor can be self contained - 1 large double and sofa bed in large kitchen/diner, shower room and fully equipped kitchen, leading out to pool area. Upstairs has lounge (TV, video, DVD), kitchen and double bedroom en-suite, all leading onto terrace. Plus 2 further twin rooms and family bathroom. Cot/high chair/bed guard available if required. There is a small hotel with lovely restaurant within walking distance, plus small village (also walking distance) for ice-creams/bakery etc. Alberic town is a 5 minute drive, for bars, supermarket, weekly market etc. Local markets are held daily around the region. Valencia city is around 30 mins by train and the historic town of Xativa is only 10 minutes away. We can now also offer a special short term Gym membership to a fantastic modern fully equipped gym, please ask for details. En-suite shower to bedroom 1. Family bathroom with bath. Family bathroom with shower (ground floor). Upstairs living room incl 2x large sofas, dining table and chairs, TV/video/DVD. Great views. Exit onto terrace. Ground floor lounge/diner includes double sofa bed, kitchen table and chairs. Exit to pool area. Kitchen 1 (upstairs) fully fitted, all usual appliances, fridge/freezer, cooker/hob etc. Kitchen 2 spacious (ground floor) fully fitted, usual appliances, washing machine, fridge/freezer, dishwasher, cooker etc. + sofa bed if required. There are a number of golf clubs in the region, including a new 18 hole complex 'Foressos' near Valencia (Picassent) (30 min drive), and excellent club in Denia (approx 50 mins) and 'El Bosque' in Chiva. Notes on accommodation: Cot, high chair and bed guard are available on request. A safety deposit box is also available. Outside: Covered terrace, barbecue, large private pool, outdoor furniture. Cleaning / Towels / Linen / Maid service: Linen and towels provided. An extra clean/linen change during your stay is available upon request. Welcome pack available if required. Spent the last few weeks there with my family. The pictures do not do this villa any justice. Big and spacious, loads of room. This place is just what we wanted, out of the way in a quiet location not too far from Valencia or beaches. Good local towns for meals and shops. The owner Darren was more than patient with any questions and was quick to reply to emails. Well recommended if you want to be out of the way but not to far from the tourist areas. cant get enough of this place! 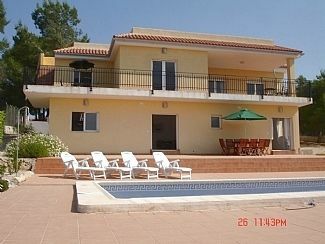 its the third year running me and my family have been to this idyllic Villa, and we are going again in a few weeks time! wonderfully equipped villa with stunning views. If you want a beach holiday it is only 35 minutes away in the car. we have just returned from this amazing villa, and i have to say it surpassed all our expectations! beautiful, spacious, well equipped property.stunning views, Darren and Hazel the owners, could not have been more helpful with the booking, and kept in touch via e mail. they even sorted us out with some essential groceries as we arrived on a bank holiday. there is a lovely lady Alison, who meets and greets you, and you have her number if you have any queries. I recently went to stay at the Villa and was very pleasantly surprised at how nice the Villa was and even more so with the View outside of the bedroom window. The location is brilliant if you are looking to be in a quite and private location yet you are only minutes away from local towns and about half an hour from Valencia city. Alison and Darren are the only 2 people I have had the pleasure of dealing with and they come highly recommended. Great communications and a pleasurable experience. Car hire is recommended. Nearest airport is Valencia (30/40 mins), alternatively Alicante is a 1.5 hour drive. Further details upon request. Valencia 30 mins by train. Alberic town is a 5 minute drive. Town of Xativa is only 10 minutes away. Local markets are held daily around the region (details at the villa). Booking Notes: To hold your reservation we require 20% deposit. Full payment is required 2-3 weeks before arrival. Returning guests qualify for 10% discount. Changeover Day: Change over day is flexible, depending upon bookings made. Notes on prices: Please contact us for Sept/Oct special offers.